KUALA LUMPUR — Malaysia’s Halal industry tonight recognised the contributions of eight individuals, institutions and companies as recipients of the 2018 Halal Excellence Awards in appreciation for their outstanding achievements in the global Halal industry. 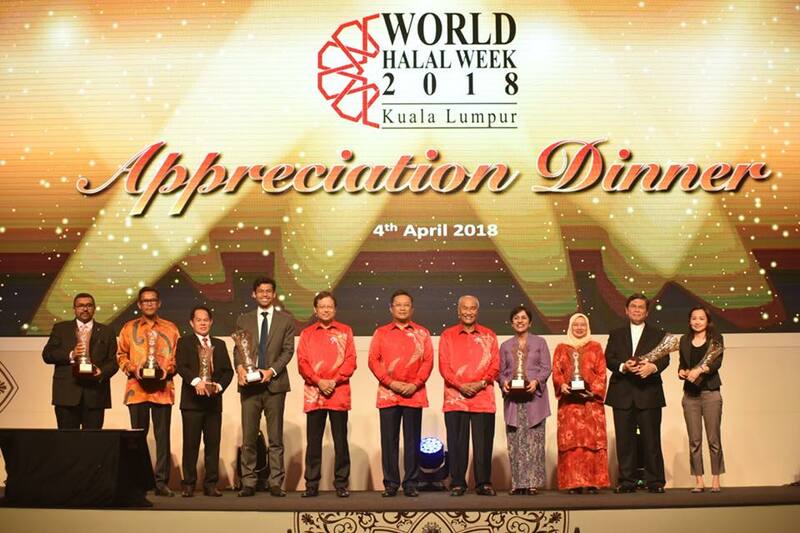 The awards by the Halal Industry Development Corporation (HDC) were presented tonight by Malaysian Deputy Prime Minister Dato’ Seri Dr Ahmad Zahid Hamidi at an appreciation dinner held in conjunction with World Halal Week 2018 (WHW 2018). Also present were Minister in the Prime Minister’s Department Datuk Seri Abdul Rahman Dahlan, former Prime Minister Tun Abdullah Haji Ahmad Badawi, and HDC’s Chief Executive Officer Dato’ Seri Jamil Bidin. Brahim’s Holdings Berhad was awarded the Halal Excellence Award in honour of their exceptional contributions and commitment for the development of the overall Halal industry. The award was accepted by its Executive Chairman, Dato’ Seri Ibrahim Bin Haji Ahmad. The Halal Brand Award was presented to McDonalds Malaysia in honour of a high-profile brand and trademark built throughout the Halal industry, and to celebrate the company’s creative excellence and consistency in promoting the international acceptance and upholding the Halal integrity. The Human Resource Development Fund (HRDF) meanwhile, received the Talent Development Award in acknowledgment of its outstanding contributions made to uphold human capital development in the Halal economy. Malaysia has trained more than 60,000 Halal knowledge workers since 2008. For its innovating ideas including efforts and commitment in pioneering Halal research & development through science and technology, the Halal Products Research Institute (HPRI) was presented the Halal Science and Research award. Meanwhile, Nestle (Malaysia) Berhad and Mamee Double-Decker (M) Sdn Bhd were named Successful International Halal Company and Successful Malaysian Halal Company respectively, for their fast growth and innovative business processes, product development, enterprise, sustainability, leadership, and overall business success in penetrating the global Halal market. Broadcasting agency NHK, Japan was also recognized with the Halal Awareness Initiative Award for its outstanding initiatives that have helped contributed to higher levels of consumer awareness internationally and to encourage organisations and global companies to venture into the Halal businesses. Themed “Building for the Future”, the World Halal Week 2018 (WHW 2018) was officially opened by Dato’ Seri Dr Ahmad Zahid today. WHW 2018 is led by the Halal Industry Development Corporation (HDC), as the central agency under the Prime Minister’s Department of Malaysia and organised in collaboration with the Malaysia External Trade Development Corporation (MATRADE) and the Department of Islamic Development Malaysia (JAKIM). WHW 2018 comprises of three major components: a two-day World Halal Conference 2018 (WHC 2018) organised by HDC which started today (April 4); the Malaysia International Halal Showcase (MIHAS) from today until 7 April 2018 organised by MATRADE; and the Malaysia International Halal Assembly (MyHA) which started on 26 March and ended yesterday (3 April) organised by JAKIM.